Peter Rabbit Organics baby food is simple, healthy and just what your baby needs to grow up strong. Founded in 2004 this company is small and privately owned, the company is based out of London with some US offices. Their bpa free squeezable pouches (with a no-choke cap) make eating healthy fruits and veggies so fun. 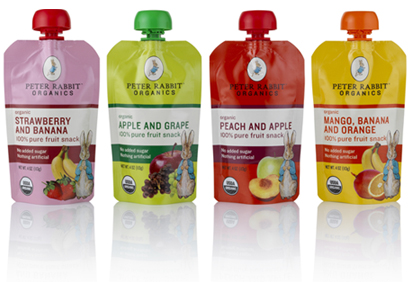 In August of 2010 Parenting magazine picked Peter Rabbit baby pouches as one of the top six kid snacks for the summer! Peter Rabbit Organics is focused on three promises: to make everything 100% organic, 100% healthy and 100% delicious. I was sent six pouches to review and my baby boy enjoyed every last drop. I also tasted each one before giving them to him. The wholesome taste was fresh, as if the fruit or veggies had just been plucked from the garden and pureed just seconds beforehand, we love that! These are great for babies, toddlers and young children, ages 6 months and up. Each pouch is a generous 3-4 oz portion which makes for the perfect meal or snack. You have the option to easily reseal the pouch with the cap and put it into the refrigerator. These are so easy to take on the go, just throw one in my purse and he has something wonderful to snack on while I am grocery shopping or running errands. To heat up your pouch all you need is a bowl or cup full of hot water, just plop the pouch in and let it sit for a couple minutes. One pouch was enough to keep my 22 lb 11 month old satisfied for 2 1/2 hours. I just gave him his pouch, he slurped it down and then he had a sippy of water. For him these are a snack, for smaller babies these would definitely make for a perfectly portioned meal. As far as people thinking that these pouches are just a trend, think again! I think that being able to let my very independent baby squeeze his own baby food pouch into his mouth is an amazing thing. He has not been interested in using eating utensils yet, in fact he just refuses to eat if there is a spoon involved lol. I love that he feels like he has "won" when he gets his pouch and I don't have to compromise on anything because what he is eating is 100% good for him. I bet these pouches would be a wonderful replacement for a lollipop or gum to keep ones ears from popping on an airplane. You know what, these yummy pouches are even great for adults! You could take one on a bike ride, it would be easy to eat while peddling along and give you some extra energy. 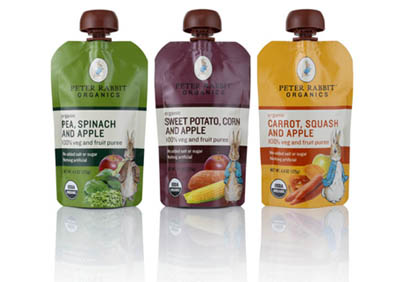 Squeezable pouches will be around for good and Peter Rabbit Organics has some of the best. You can go to the Peter Rabbit Organics website and search for a store nearest you. Pouches are also available for purchase on Amazon.com. I've seen these go from $1.19 all the way to $2.99 each pouch. Mama & Baby give Peter Rabbit Organics five out of five hearts, we love them! ...as an alternative to fresh fruits and vegetables but certainly not a replacement for fresh. These are a perfect way to sneak fresh fruits and veggies into you child's diet. When I’m just too exhausted to cut up a piece of fruit or cook, peel, or slice some veggies at the end of the day, it does feel good to be able to open a pouch and call it a day. Peter Rabbit Organics would like to give one of my readers their very own box of 12 assorted pouches! 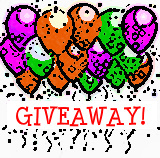 To enter just fill in the Rafflecopter form below. Giveaway ends 8/26 @12:01am.